ElectronicLocal: Is it Is or Is it Ain't? Is it Is or Is it Ain't? To paraphrase that great song by Dinah Washington "Is it Is or Is it Ain't?" a trade setup? That's the decision a discretionary trader must make numerous times a day. Lots of focus needed. Pete Steidlmayer always said to, "just get the trade on and then manage it". Well, Flo can get the trade on better, quicker and more consistently than I can. I don't need to re-invent the wheel multiple times a day. 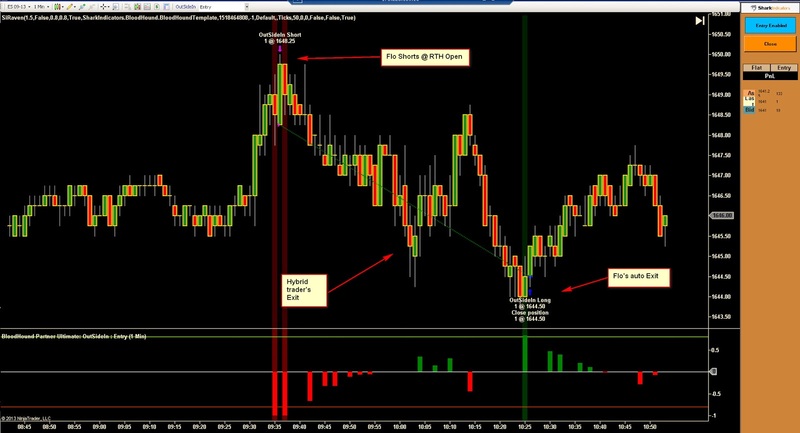 The pic below shows yesterday's (Tuesday's) ES open using Ninjatrader and Bloodhound. Do I buy it or sell it? Flo went short and then it was a simpler a matter of managing the trade. Or I can let Flo manage it and do something else. These trades when a market opens and is in imbalance, can very often be the trade of the day. "Do the trade and go to the beach" as another trader I knew in California used to say. The profit per contract was $162.50 less fees (hybrid). Not hard to trade the size in ES that you need to make a daily profit target. As you can see from the latest series of posts, I'm a big fan of using automation to at least enter trades. It just can get you to and keep you at CP much quicker. Don't get me wrong, this strategy has losing trades. Not many if you use the correct money management strategies, but losing trades non the less. Money management is at least 50% of the trade. Regarding BloodHound...is it possible to automate discretion?? I have a very deliberate way of trading but there are so many nuances that I have no idea how I'd get that into an automated entry trigger. James, the short answer is yes as successful discretionary trader has a lot of alternative actions that make up his different triggered setups. These can be duplicated in Bloodhound in most cases as "or" logics.